Learning to ride a bike is tough, especially when you’re small. Most parents assume that starting their kids out with training wheels is the way to go, but for most kids that may not be the best way. A balance bike can offer an alternative to training wheels that readies children for the challenges (and fun) that comes with riding a bike. Smart Gear Balance Bikes are much like regular bikes, but with one key difference – there are no pedals! This gives toddlers a chance to work on their balance without worrying about the coordination required to pedal. To begin with, boys and girls start out by keeping their feet on the ground and walking the bike to where they want to go. Once they feel comfortable with this, they can run to build up speed and scoot along. Finally, they can cruise along on two wheels, perfectly balanced and ready for a pedal bike. Training wheels do a great job of keeping kids upright, but they don’t do much to help build a child’s sense of balance. A child who depends on training wheels takes much longer to learn how to balance because they’re used to the wheels doing the work. However, with a Smart Gear Balance Bike, kids can focus on balancing, which makes their transition to a standard bike go much more smoothly. All Smart Gear Balance Bikes are made from eco-friendly materials. Their birch-wood construction also includes comfortable handgrips, spoke-less wheels, and comfortable seats. A built-in handle is included in the body of the bike, which makes carrying a breeze. Most models have an adjustable seat, which lets kids continue to use the bike as they grow. Finally, the handlebars have a limited turning radius, which helps keep kids from jackknifing. What fun would a bike be if it didn’t take a child’s unique personality into consideration? Smart Gear Balance Bikes come in a variety of paints and finishes that are sure to delight any child. For a simple, frills-free bike, the Classic is the way to go. Sky Rider is another simple bike that is suitable for any rider. On the other hand, the Chopper or flame bikes have bold detailing that really stands out. The Floral Hearts, Bubbleicious, and Spring Fever models are sure to please any young girl. Finally, the Police Bike will let everyone in the neighborhood know who’s in charge. No matter what your child’s preferences, there’s a bike that’s perfect for their unique tastes. You want to give your child all the support they need as they grow. Smart Gear Balance Bikes are the perfect way to help your kids learn the skills they’ll need to ride a bike. They’re also a great way to get outside and have some good, active fun. These beautiful, eco-friendly bikes are a great addition to any child’s collection of outdoor toys. Summer is a fun time of year – the weather is warm, there’s lots going on around the neighborhood, and the kids are out of school. It’s a great time to take a trip, but if money is a little tight there’s nothing wrong with having a “staycation” at home. If you and the kids are going to be hanging out in the backyard this summer, why not enrich your playtime routine with a Kidkraft Sandbox? Playing in the sand is tons of fun, no matter what your age is. Trips to the beach can get pricey, but with a Kidkraft Sandbox in your yard your children can have all the fun of the beach without all the fuss. There’s no need for buckets and shovels to lie dormant all summer. Instead, kids can dig for treasure, make sand-castles, or do whatever else they want all summer long. Having fun in the sun is a great way to spend the day, but sometimes too much sun isn’t a good thing. If your little girl or boy tends to burn easily or if you’re just concerned about too much sun, then the Kidkraft Outdoor Sandbox with Canopy is perfect for your family. This sandbox offers a large play area that’s covered by a canopy. Children can play for hours in comfort and safety underneath the sturdy canopy without worrying about painful burns. “Arrrrr” Your Kids Pirate Fans? What child doesn’t love the adventurous life of pirates? If you’ve got a little pirate of your own, the Kidkraft Pirate Sandboat is the perfect place for him to live out his dreams. This boat-shaped sandbox has two compartments for storing toys and treasures, a canopy to keep the sun off, colorful artwork, and even a steering wheel! Add to this a large play area filled with sand that’s perfect for burying and digging for treasure. It’s big enough so several small swashbucklers can play at once. Whether it’s the Pirate Sandboat, the Sandbox with Canopy, or Kidkraft ’s more basic Backyard Sandbox, these structures are built to last. Because they’re intended to be used outside, the wood they’re made from is chosen to stand up to the elements. Reinforced wooden panels make sure that your sandbox won’t get bent out of shape or succumb to bad weather. They’re designed to stand up to rough play and are all large enough that a group of children can have fun at the same time. While some assembly is required, each sandbox comes with detailed instructions that make set-up quick and easy. Summer and sand go together like peanut butter and jelly. If your kids are longing for a sandy shore, you can satisfy that desire without having to leave home. A Kidkraft Sandbox is a fun, safe, and sturdy way to add some sandy playtime to your child’s long summer days. When children play they often dream about the things they’ll do when they grow up. Things that seem mundane to adults take on an exciting new life when seen through kids’ eyes. Smart Gear Pretend Play Toys are designed with your child’s imagination in mind. These eco-friendly toys are the perfect addition to any game of make-believe. Many girls love the idea of having their own kitchen. Why not give your child everything she needs to cook up a delicious pretend meal? Smart Gear has everything needed to make a kitchen complete, including a child-sized sink, cooker, microwave and refrigerator. If playtime is on the go, the My Portable Cooker is a great choice. Just fold it up and bring it along with you! If space is an issue, the Smart Gear Wonderwold Cooking Center combines an oven, a refrigerator and a sink into one compact play station. One of the oldest and most loved types of dramatic play is playing house. Help your toddlers learn more about what goes into caring for a home with Smart Gear cleaning toys. The Wonderworld Wonder Vacuum is perfectly sized for little hands and is small enough to get into all those nooks and crannies. 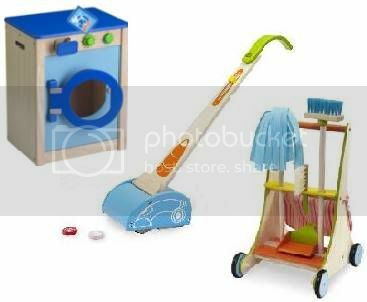 The Wonderworld Wonder Cleaning Cart comes with everything a kid needs to keep a neat house, including a child-sized broom, mop, dust pan, hand brush, and storage pouch. All of this fits onto the sturdy rolling cart. Any young entrepreneur will love the chance to open a store of their own with Smart Gear pretend play toys. The Wonderworld Wonder Store stand is perfect for a budding shopkeeper, giving him three shelves to display his goods and a cabana-style shade to keep the sun off. This stand is perfect for role-play, especially when paired with the Wonder Shopping Cart. If your young business-man or woman is ready to test their skills on the public, the Wonder Store stand is also ideal for running a lemonade stand. There’s no need to give up environmental responsibility in order to give your kids a fun play experience. Smart Gear is a company devoted to taking care of the environment while delivering quality products. Their toys are made with renewably grown rubberwood, formaldehyde-free glue, and water-based paints. For every tree that is used to make one of their toys, two more are planted. Even the packaging they use is created from at least 70% recycled materials. These toys prove that a commitment to the environment does not lead to a drop in quality – all of Smart Gear’s products are built to last. There’s no reason to sacrifice anything when providing playthings for your child. Kids love the creative games they can play with these attractive and sturdy wooden toys. With Smart Gear Pretend Play Toys, it’s easy to entertain your children in an environmentally conscious way. Have you ever seen a group of kids playing on scooters? Chances are they were a group that was having a whole lot of fun. Fast and sleek, scooters are a great way for kids of all ages to take part in active play. When it comes to this type of toy, though, not all scooters are created equal. When it comes to looks and quality, the cream of the scooter crop is the Morgan Cycle Scooter. There are a number of things that set Morgan Cycle Scooters apart from your average scooter. The first thing that makes them stand out is the shape of their frame. Instead of the more streamline models that are common today, Morgan scooters venture back to an earlier time. Their sleek, rounded shape will make you think of the scooters that were popular in the thirties. You can bet that your child will stand out when riding along on one of these beautiful toys. The next thing that makes Morgan Cycle Scooters a cut above is their safety and usability. Not all children are able to handle a scooter with two wheels, which is why these retro scooters have three. Two wheels are used in the back to give added stability. This is helpful for younger boys and girls who are just learning how to get around on a set of wheels. As your child grows, this scooter will grow with them. The handlebars can be adjusted to match different heights for a safe and comfortable ride. Safety and quality go hand in hand when it comes to kids toys, and the Morgan Cycle Scooter is no exception. These scooters are crafted to be some of the highest quality scooters out there. The old fashioned pressed steel construction is durable enough to stand up to the rigors of active play. Chrome wheels and solid rubber tires are rugged and durable. Finally, the coatings are made of non-toxic materials, so there are no worries about what chemicals might be coming in contact with your children’s skin. Speaking of coatings, there’s one more thing that really sets Morgan Scooters apart – their colors! The colorful coatings used on these scooters give them a sense of style and personality that’s not always easy to find. No matter what your child’s favorite style or color is, you’ll find something to suit them. Whether they like the classic colors of pink, blue, or red or are interested in silver or red with gold accents, you can find a scooter to please them. If you really want to turn some heads, the Morgan Cycle Pink or Aqua Retro Scooter with Crystals is the way to go. These scooters have almost 400 crystals hand applied to each of them to give them a dazzling sparkle whenever they’re in motion. Your child is unlike any other child out there. Why not give them a scooter that is just as unique and special as they are? Morgan Cycle Scooters are safe and have a retro flair that really makes them stand out. Your kids will love both their looks and the hours of active play they can engage in with these scooters.